Geezer Skier: Ski Technology Evolves? I recently finished reading and summarizing a book titled The Nature of Technology - What It Is and How It Evolves by W. Brian Arthur. From an engineering perspective it stimulated reflection on the changes in technology I have observed over the 76 years of my life. There is no doubt that society has not only seen an evolution in technology but has also seen revolutionary changes in technology. The author goes to great lengths to define technology and then to examine the elements that contribute to technological development. He speaks to the structure of technology, invention, modularity, recursiveness, phenomena, domains, combinations and evolution as elements of the fabric of technology. This is the first time I have encountered such a comprehensive analysis of the broad concepts of technology. As a result of my new learning I am inspired to apply it to the evolution of technology in skiing. If technology can be considered a means to fulfill and human purpose then we should be able to see how technology has evolved to enable us to downhill ski. Not just to ski but to ski with more pleasure and skill as time goes on. Most geezer skiers remember the days of leather boots, long wooden skis, bear trap bindings, woolen clothes and rope tows. Boots, skis, clothes and lifts have made enormous strides of technological improvement over the last 75 years. Engineering a better product demands applying knowledge and new and improved technologies that evolve to provide a better solution for a given purpose. When dealing with an engineering design problem, I would always advise my students to remember that solutions would depend on dealing with geometry, properties of materials and forces. Within those elements of a solution an understanding of different phenomena was essential. In the ski industry there have been great strides in incorporating new materials and geometries in the construction of skies, bindings and boots. Analysis of forces generated in skiing both on the skis, boots and the person has reached new levels. Will skiing technology continue to evolve? The answer is yes. However, the rate of change is likely to be both gradual and radical. Past history demonstrates this. The transition to shape skis was a radical transition that took the ski industry by storm. Since that radical change, manufacturers have been tweaking the shaped ski for varying terrain, people and snow conditions. Recently the adoption of rocker shape design has introduced a new variation of ski shape. In my opinion, boot design has a lot to be desired. Most geezer skiers have experienced many different technological developments for boots. However, no single boot technology has evolved that guarantees a totally satisfactory functional and comfortable fit. Rockers - The New Wave? As the new ski season approaches I will be observing the rate of adoption of the rocker skis by the general skiing public. Will this evolved technology sweep the industry? And what will be the next wave of skiing technology? Maybe we will see another new way to descend the snowy hillsides. Who would have thought snowboards would be a ubiquitous way to ride in snow? 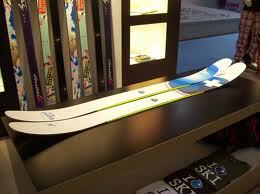 Those are great looking skis! Source?